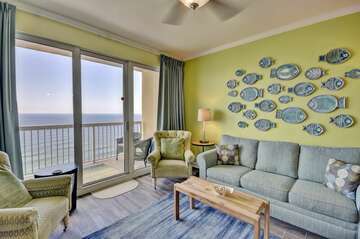 Looking for the best of the best in Panama City beach rentals? You’ve come to the right place. We’re a vacation rental company offering travelers upscale vacation rentals, with condos and multi-bedroom home rentals available along Florida’s scenic Gulf Coast. You’ll find amenities you won’t find at hotels, including covered, secure parking, spacious beachfront properties, and full kitchens to help you stretch your vacation budget. Our rental properties are located right where you want to stay, with condos and homes available in Panama City Beach, Sandestin, Destin, and idyllic communities along the scenic highway 30A, including Seacrest Beach, Rosemary Beach, Blue Mountain Beach, and others. Check-in is easy, with automatic keyless entry that allows you to focus on what really matters: getting the most out of your time under the Florida sun. There are a lot of resorts in Panama City Beach, FL, but only our rental properties offer luxury and privacy at such a great value. We offer an affordable and quality alternative to other vacation property management groups, and everything you need for a comfortable trip. Our properties are a fit for the whole family, with more than enough room to relax, sleep, and play. Search our available condos to find upscale rentals that meet all of your vacation needs and are in close proximity to prime entertainment and beaches. We have years of experience offering premier condos for rent in Panama City Beach, FL and the surrounding localities, and we’d be honored to host you during your next stay. We offer the best vacation rentals in the area, and our competitive pricing means you have more money left over for enjoying every second of your stay. When you’re getting ready for your next Florida vacation, be sure to get in touch and find out just how simple it can be to secure the perfect home rental away from home. Discover why so many property owners trust Blue Sun Properties to manage their rentals. We oversee everything from deposits and payments to housekeeping and maintenance so that all you have to worry about is getting a great return on your investment. Our goal is the same as yours: to enhance the value of your vacation property and make renting it out as easy and stress-free as possible. As a property owner working with Blue Sun Properties, you’ll receive access to our private owners portal, where you can keep an eye on what’s going on with your property. We also offer a mobile owners app to help you oversee your property on the go. Get the most out of your rental properties by working with the company that knows Florida’s vacation rental market in and out. We’ll be with you every step of the way, and are always available if you have questions or need some assistance. Let’s work together to make the most out of your Florida condo rental. If you’re seeking a rental management company to list your property with, contact Blue Sun Properties today!